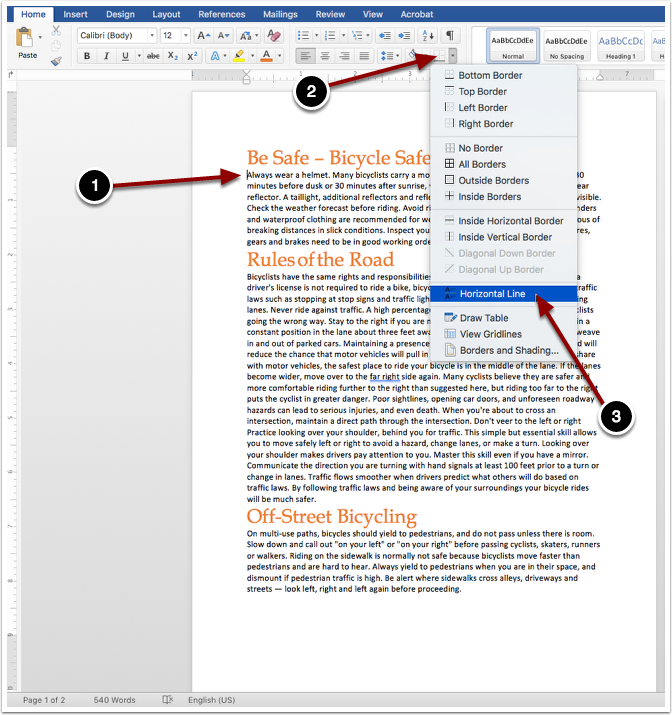 Place cursor at the beginning of the paragraph. If required, do the same process for all other titles. Prev: How Do I Add A Page Border? How Do I Format Columns and Margins? How Do I Edit Text? How Do I Get Rid Of The Outline Around A Text Box? How Do I Insert A Line Into Word? How Do I Add A Page Border? How Do I Insert A Text Box In Excel? How Do I Add Animation To A Shape? How Do I Put an Action Button in Microsoft PowerPoint? How Do I Create A Weebly? How Do I Complete a Mail Merge? Where can I find the password for the syllabus quiz? Where can I find the passwords for the instructions quizzes (Power Point, Spreadsheet, and Word)? Where Are The Other Sections Under The Content Area? How Do I Add Audio Recording To a Power Point Presentation? Where Can I Find The Feedback And Graded Rubric For My Assignment?